In the early 50s, during my first few years of school, the teacher would occasionally hustle us into the auditorium for a movie. Always in black-and-white, these movies were sometimes on health, sometimes "Francis the Talking Mule," and sometimes a documentary. One day, they showed us a film about George Washington Carver. I was amazed that one man could achieve so much. It just wasn't a possibility I had considered until that moment. The example of this great man stayed with me for the rest of my life. 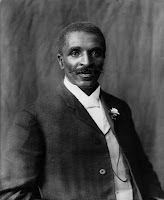 George Washington Carver (1864 - 1943) was an innovative scientist and educator. After the Civil War, cotton agriculture was depleting the soil, and he promoted the raising of sweet potatoes, peanuts and other alternative crops. Much of his fame came from inventing creative ways to use peanuts. He encouraged poor farmers to grow peanuts to enrich their lives. He also created dozens of new uses for peanuts to boost a demand for them. On ACCOUNTABILITY - "Ninety-nine percent of the failures come from people who have the habit of making excuses." On AWARENESS - "I love to think of nature as an unlimited broadcasting station, through which God speaks to us every hour, if we will only tune in." On CREATIVITY - "Since new developments are the products of a creative mind, we must therefore stimulate and encourage that type of mind in every way possible." On EXCELLENCE - "When you can do the common things of life in an uncommon way, you will command the attention of the world." On FAIRNESS - "Education, in the broadest of truest sense, will make an individual seek to help all people, regardless of race, regardless of color, regardless of condition." On SELF-DEVELOPMENT - "Education is the key to unlock the golden door of freedom." On VISION - "Where there is no vision, there is no hope." And he did it at a time of great discrimination. Extraordinary man! I have his sweet potato biscuit recipe, going to be on our table soon.